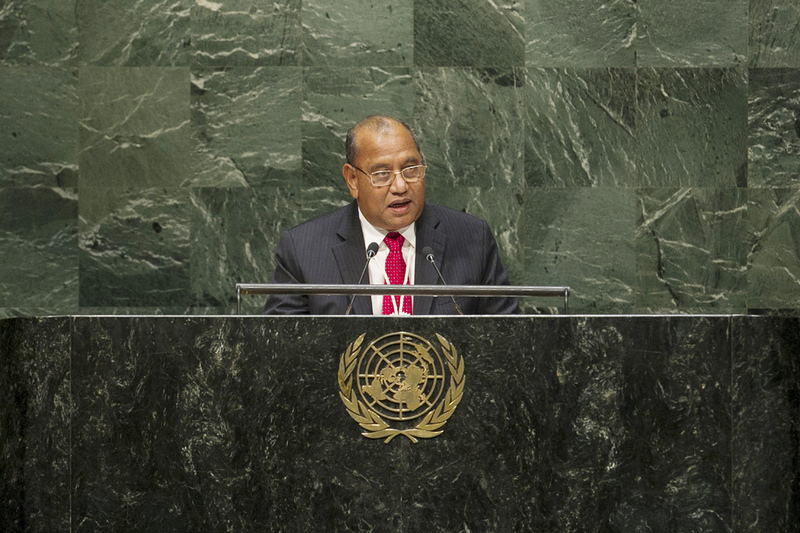 CHRISTOPHER J. LOEAK, President of the Marshall Islands, said that climate change posed no greater threat in the world than on its Pacific shores. As a low-lying nation, his had no higher ground and, ultimately, nowhere to go. Leaders could not afford "consensus games and squabbling" on that issue as words and intentions alone would not meet the major challenges ahead. Without action, he warned, it would not be possible to reach the carbon emission targets necessary to save his nation. Direct political ownership and “creative political solutions” were needed to meet that global challenge. To that end, he said, the Marshall Islands strongly supported the call for a global phase-down of hydrofluorocarbon gases under the Montreal Protocol and would participate in the upcoming Climate Conference in Paris to carry the voice of its people. Although that was a global fight, it was one that truly hit home. Pushing back rising waters was crucial to saving countries’ future. Leaders must respond to the climate change threat with courage and not simply “bury their heads in the sand to an obvious climate reality”, he urged. The Marshall Islands stood firm with fellow Pacific leaders in their call for a United Nations Sustainable Development Goal on oceans, he said, adding that the Pacific Ocean and its rich fisheries was their lifeline. Protecting the world’s vast blue water should be a priority as it represented two thirds of the world’s surface and would help address global food security. Fishing nations must look beyond their immediate needs and towards their global responsibility. Recent progress on sustainable fishing had helped empower Pacific nations, he said, adding that oceans were equally valuable as a resource for alternate sustainable energy, including ocean thermal energy conversion. As a country which had had 67 nuclear tests conducted on its soil, the Marshall Islands was also concerned about nuclear proliferation, he said. Today, the country still bore the burden and impacts of those tests. Awareness of the catastrophic consequences of nuclear weapons must underpin all disarmament efforts, he stressed. The Marshall Islands looked forward to addressing those issues during its participation next year in the United Nations Human Rights Council Universal Periodic Review. The United Nations should not only stop the spread of nuclear weapons, but should pursue a world without them.